Have you ever wondered how a bird makes a nest? Or how to bend willow into beautiful shapes? Perhaps you just questioned how invertebrates survive at the bottom of a pond? 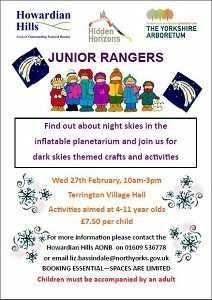 Our very popular Junior Rangers sessions run one day each season during school holidays. Taking inspiration from the season the children are encouraged to get creative and to venture outside to learn about the natural world first hand. Sessions are usually held at The Yorkshire Arboretum in conjunction with their Education team and are aimed at children aged 4 to 11. Activities have included making willow wreaths, yule logs and Christmas cards, a nest building challenge, Easter egg hunt and spring story trail, pond dipping, adaptations game, mini-beast hunting and butterfly mobiles. Children need to be accompanied by an adult, but most adults become engrossed in being creative themselves! The children enjoy the mixture of indoor and outdoor learning and the opportunity to get to know each other in an informal out-of-school setting.